Results: In studies on a human skin tissue model, researchers at Pacific Northwest National Laboratory used a systems biology approach to show that an ionizing radiation dose mimicking that received during a CT scan is sufficient to alter genes in two cell layers. The epidermis is the outer skin layer, and the dermis is beneath it. The researchers found 1452 genes altered in the dermis and 428 genes altered in the epidermis. Genes altered in the two layers showed little overlap, but the affected signaling pathways were similar. These results were found to be in good agreement with human in vivo data, which suggests that the 3D human skin tissue model, though greatly simplified, provides a faithful representation of intact tissue. It further highlights the need for cell type-dependent analysis, because the involved cell layers showed differences in their response at the gene, protein, and cellular levels. Why It Matters: Medical exposures are the primary source of non-background radiation exposure in the U.S., and more than 70 million CT scans are performed annually. These scans result in organ doses between 5-100 milliSievert (equals 5-100 centiGrays, or cGy). A second source of radiation exposures is doses in the normal tissue during radiotherapy treatments. Current risk estimates for developing radiation-induced cancer and other health problems are extrapolated from high dose exposure data, and large uncertainty exists in defining the dose-response relationship in the low-dose region. The exposure scenario in this study (10 cGy) mimics the dose limit for a full body spiral CT and the skin dose in radiotherapy procedures. Methods: The scientists performed a microarray study on a 3D reconstituted human skin tissue model. They used quantitative reverse transcription polymerase chain reaction (qRT-PCR) to validate the microarray data. They then analyzed the proliferation profile and the expression of proliferating cell nuclear antigen (PCNA) in both layers and found that 50 or 200 cGy of ionizing radiation exposure decreased the percentage of proliferating cells in the epidermis, while 3 or 10 cGy were insufficient to induce the same effect. Later, samples exposed to 50 cGy returned to control levels; however, the 10- and 200-cGy exposures still showed decreased proliferation compared to the control. No significant changes could be detected in the dermis because of the low numbers of proliferating cells. PCNA expression increased significantly in 10 and 200 cGy exposed samples before returning to control level. No statistical significant change in apoptosis was detected, which suggests PCNA involvement in DNA repair and synthesis instead of apoptosis. What's Next? The scientists want to study radiation quality effects on the differentiation profile of the cells in the epidermis. Differentiating cells are no longer active but provide important structural proteins, and in their terminal differentiated state, they form the skin barrier. A breakdown of the skin barrier function can lead to fluid loss and invasion of pathogenic germs. They intend to investigate if radiation-induced alterations in proliferation affect the differentiation process and lead to skin barrier damage. Acknowledgments: This work was supported by the Low Dose Radiation Research Program of the U.S. Department of Energy Office of Biological and Environmental Research and the National Aeronautics and Space Administration. The researchers included Claere von Neubeck, Marianne Sowa, Harish Shankaran, Norm Karin, Paula Kauer, William Chrisler, Xihai Wang, Joe Robinson, Katrina Waters, and Susan Tilton, all PNNL. Reference: von Neubeck C, H Shankaran, NJ Karin, PM Kauer, WB Chrisler, X Wang, RJ Robinson, KM Waters, SC Tilton, and MB Sowa. 2012. 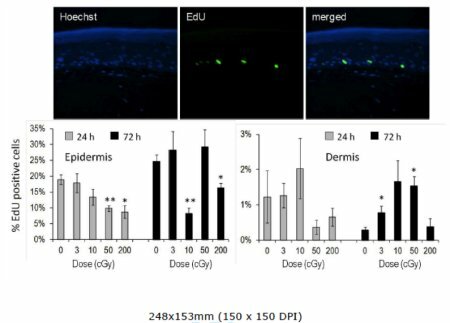 "Cell Type-Dependent Gene Transcription Profile in a Three-Dimensional Human Skin Tissue Model Exposed to Low Doses of Ionizing Radiation: Implications for Medical Exposures." Environmental and Molecular Mutagenesis 53(4):247-259. DOI:10.1002/em.21682.